Founded in 1907, the Winchester SPCA has been advocating for animals for over 100 years. 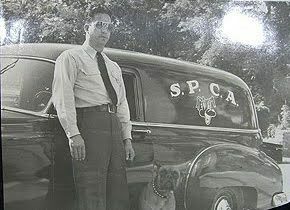 The SPCA was founded by a small group of concerned citizens wanting to make a change for animals and their community. In 1951, the first shelter was built. Located on Highland Avenue in the back yard of the animal control officer, Mr. Ervin S. Cleveland. Its function was to house stray dogs. 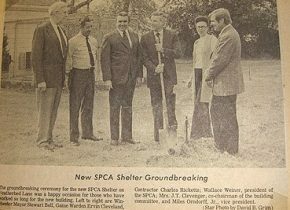 On June 16 1986, the Winchester SPCA entered a contractual agreement with the City of Winchester to provide safe housing for animal victims of abuse, stray, and owner-surrendered animals. This agreement is still in effect and has been expanded by the SPCA to include medical and behavioral rehabilitative support. As space allows, we also accept owned animals from residents of Frederick and Clarke. In 2005, a 1500-square foot addition was constructed to better meet state requirements for a city shelter. In 2013, the adjacent property at 111 Featherbed Lane was purchased to create a state of the art adoption center. 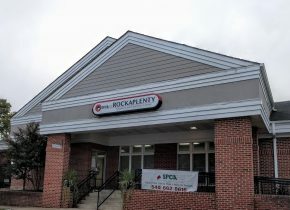 With the help of a generous donation from the Elizabeth C. Clark Foundation, the Rock-aplenty Adoption & Education Center opened on April 12th, 2015 and now houses strictly adoptable, vaccinated, spayed/neutered and micro-chipped pets, with the original shelter building at 115 Featherbed Lane becoming an admissions & rehabilitation center. In 2012, the SPCA made a public declaration and announced their commitment to save the life of every adoptable animal. By 2014, they saved 90% of the animals entrusted to their care. Today, those lifesaving efforts continue. In 2017, the shelter ended the calendar year with a 97% live release rate. This SPCA has been a no kill facility since 2012. Mr. Ervin S. Cleveland, SPCA Agent. Groundbreaking for the SPCA's location at 115 Featherbed Lane.